Provide server functionality, such serving web pages. Coordinate access to of a shared resource, such as a database. Perform work for a foreground application, such as file system access. Note: This document was previously titled System Startup Programming Topics. This document provides information that developers of daemons and other low-level system services need to write their code and incorporate it into the startup process. It also provides some useful information for system administrators who must manage the startup process on the computers they manage. Terminology Note: The terms “service” and “daemon” have several meanings in different contexts, with further variation over time and from one development community to another. In this document, service refers to a background process that supports a full GUI application in some way, for example by registering a global hotkey or by performing network communication. Daemon refers to all other types of background processes, especially those that don’t present any kind of user interface. OS X provides a variety of background process types with different characteristics, designed for a different situations. There are also several ways for other processes to communicate with background processes. Choosing the appropriate design for a background process is an important first step. Having made the design decisions, you are ready to begin writing code. These chapters guide you through the process of creating specific types of background jobs. Although it is recommended that background jobs be launched on demand, in some cases running the job on a timed schedule is the most appropriate solution. Logging Reference explains how to use the logging mechanisms provided by the system to assist during debugging and end-user troubleshooting. 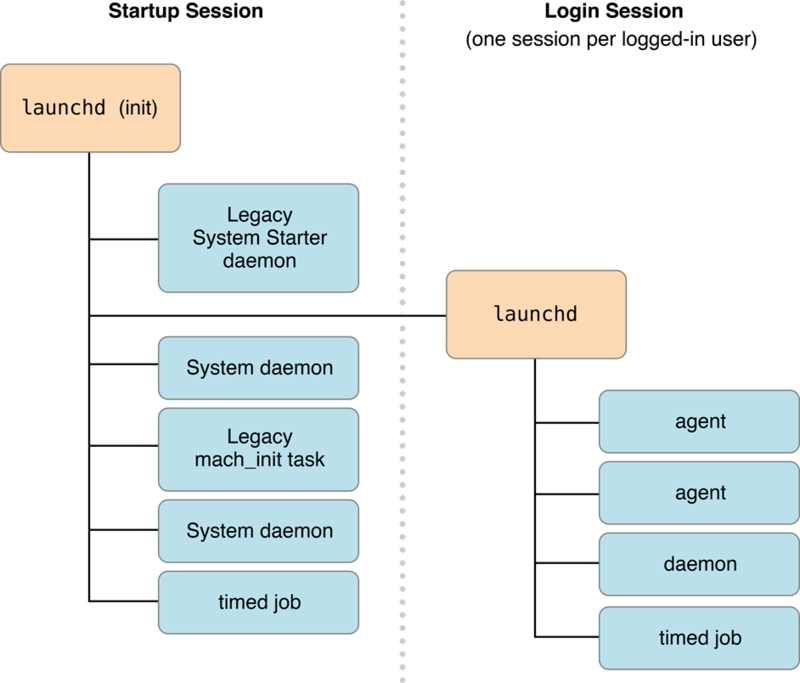 Daemons and Agents provides additional details about implementing launch daemons and agents. Kernel Programming Guide and Kernel Extension Programming Topics describe how to write kernel extensions and other kernel-level background processes. Networking Overview describes the APIs available for sending and receiving data across the network.